McCloskey Introduces I44RV3 Impact Crusher | Bison Iron Corp.
a new highly efficient version of its I44R mobile impact crusher. 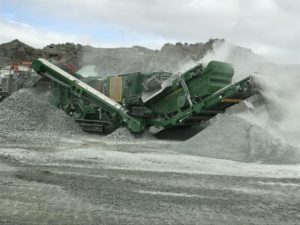 The I44Rv3 combines the productivity of a 44” impactor with the versatility of a full screening and recirculating system, allowing operators to produce a crushed and screened final product with one machine. Following worldwide field site visits, the feedback from the customers has resulted in significant other changes, including direct drive, an enhanced material flow path, larger pre-screen, and a more open chassis. Other new features include a more open chassis for ease-of-access, a larger double deck prescreen for more efficient fines removal, and a direct drive crusher, delivering more power, along with lower fuel costs. The I44Rv3’s new larger 7’ double deck prescreen brings more efficient fines removal to production, maximizes the crusher’s productivity, and delivers screened product via a straight chute to the 650mm side conveyor. The main conveyor is now wider (1200mm/48”) to accommodate a larger amount of prescreen material, and to allow for better discharge from the crushing chamber. The I44Rv3’s versatility and upgraded design makes it ideal for some of the toughest applications worldwide, including asphalt recycling, concrete recycling, rock crushing, construction and demolition.